It has been a while since my last post (this is starting to become my catchphrase...), which I had only made to fulfill a project requirement. I'm still working on graduating from text into full video, but for the time being you'll have to settle for reading my inane ramblings instead of watching them. So, what have I been up to lately? Well, I've been finishing up with my Bachelor's Degree, working full time, and going on a bit of a retro gaming binge with classics from the 16 and 32 bit eras. 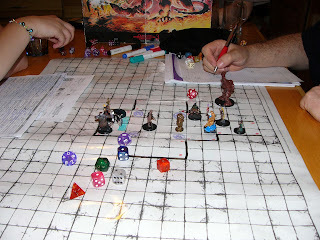 I also recently got into pen-and-paper RPGs with the biggest and best of the genre, Dungeons & Dragons. Let's face it, are you really surprised? 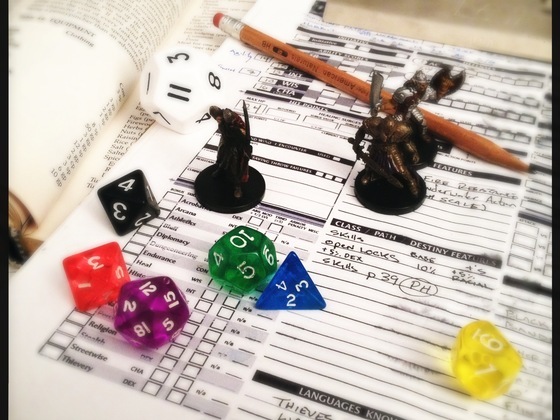 For those who are unaware, Dungeons & Dragons is a role-playing game in which players take the role of various heroic adventurers (paladins, wizards, barbarians, rogues, etc.) and embark on a quest which is set up by the group's Dungeon Master. Each character's vital statistics are recorded on paper and the adventure plays out via narration from the DM, with input from the players who are acting in-character during key scenes. Combat encounters are structured as turn-based exchanges between the player characters and a group of enemies controlled by the DM. Attacks and other actions are governed by the rolling of dice to determine the success/failure of each action. It's complicated, but once you get the hang of it it's a fun and creative game. I've played the game once before, but when my friends and I got together to start a new game, I was elected to run the game as DM. Probably because I'm organized and a creative storyteller. Either that, or they just didn't want me on their team. Kind of ironic, as you'll later see. Anyway, the publishers of D&D, Wizards of the Coast, regularly publish several campaigns that DMs can utilize for their players. A campaign constitutes a full adventure for players to undertake, consisting of an inciting incident or "hook" to get the characters involved, a series of events and challenges for them to deal with, a story to tie it all together, and rewards for completing those challenges and the main quest. However, I decided to put in some additional effort and write my own custom campaign for my players. Time will tell if this was a really stupid idea, since this is my first time as a DM, but so far it's working okay. Editor's Note: For anyone who might ask, I'm using 4th Edition rules. D&D has gone through several changes over the years in terms of rules and game mechanics. Some people prefer 3.5 Edition because it's more specific and offers greater creative opportunity, but I can't speak to that. I've only ever used 4e, and I'm comfortable with it, so all y'all can deal with it. Each of my five players had their characters ready ahead of time, using either the official D&D Player's Manual or the online Character Creator that Wizards offers. If they hadn't, we would have likely spent the first hour or so making a character for everyone that suits their tastes. Typically, each member of the party should serve a specific function, as outlined by the game mechanics. There are Strikers (focus on dealing offensive damage), Defenders (focus on attracting enemy attention and taking hits), Controllers (focus on using special abilities to affect the enemy's movements and actions), and Leaders (focus on maintaining the party with healing and enhancement abilities). A good group should have one of each to cover the bases. A group with no Striker won't be able to dish out damage, a group with no defender won't be able to take it, and so on. So let's get into the first session recap. I provided the group with background information on the setting for the adventure. 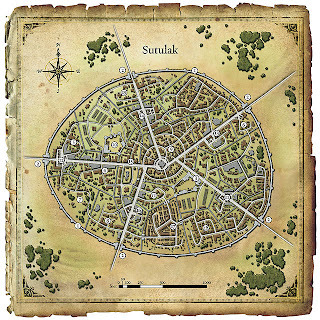 The city of Sutulak (which I appropriated from the D&D book Cityscape) has a population of just over 10,000 made up of mostly humans with sizable communities of other races such as elves, goblins, dwarves, half-orcs, and so on. It was once known as The Slaver City because it functioned primarily as a trade community where various commodities (legal or otherwise) could be sold, and slave labor was their major export. A large stone wall surrounds the city, 50ft high and 6ft thick, with five gates set around the perimeter as the only means of entry/exit. Here's where my story splits off. In recent years, there has been a major upheaval in the way Sutulak operates. The presiding King, Steven Arroway, was convinced by the plight of the slaves held captive in his city to declare slavery illegal within Sutulak. This mass emancipation came at a dire cost, as the economy of the city collapsed overnight. Without their primary export, Sutulak saw the departure of many traders and business owners who saw their profits vanishing before their eyes. However, while some of the former slaves elected to leave as well, others remained and took over many of the businesses within the city. 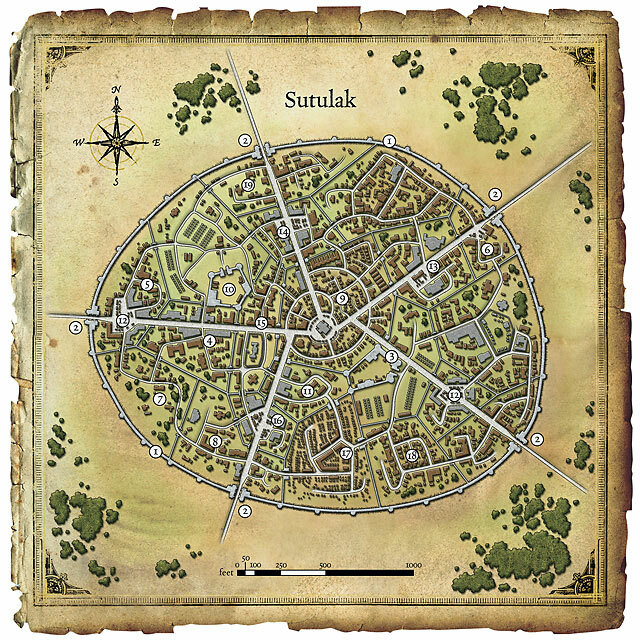 Slowly but surely, Sutulak began to improve as a spirit of co-operation encouraged the various races to work together. Embassies to the Elven and Dwarven nations were established first, and others were soon to follow. All friendly races were welcomed to this new beacon of civilization. But there is a dark shadow moving over the city and its inhabitants. In recent weeks there has been a string of murders and disappearances. People are abducted off the street by unidentified figures in black robes, either to be found brutally murdered in a secluded area or not found at all. The city guard are at a loss to find the culprit, and tensions are running high among the citizenry. Pro-human activist groups are making accusations towards some of the recent non-human immigrants, who respond with indignation and anger. If the situation isn't resolved soon, the conflict could escalate to a full-scale race war. Next post I'll get into the recap for the official start of the campaign, which includes the introduction of the characters and the first few encounters.